Taking 4-5 hours to complete, this steep 6km return climb to Quamby Bluff 20km south of Delorain is fantastic day hike passing through rainforest, vast rock sprees, lush Myrtle Forests and splendid alpine scenery before reaching the 1250m summit. With breathtaking uninterrupted 360 degree views from the top stretching as far as Bass Straight on clear days, the challenging 500m climb to the summit of Quamby Bluff is definitely well rewarded. View Google Map Directions Leaving Launceston take the A3 exit onto National Highway 1. From there take the route 1 exit towards Prospect/Devonport. Continue along National Highway 1 for 43km before exiting onto Meander Valley Road (A5) towards Deloraine. Before crossing the bridge into Deloraine, turn left onto East Parade (A5, signposted for Meander/Liffey Falls) and continue for 7km before turning left onto Highland Lakes Road. 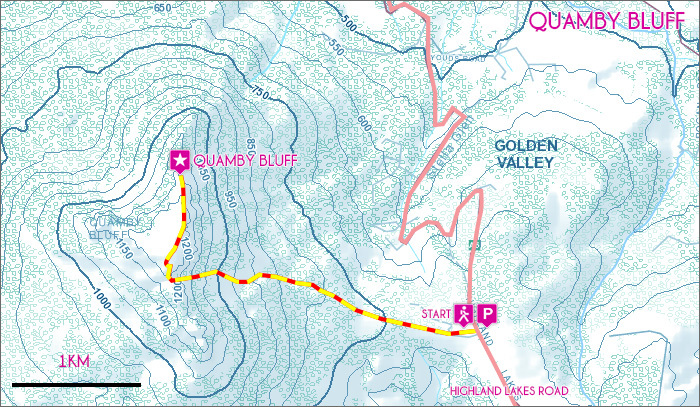 The Quamby Bluff trailhead carpark is on the left hand side of the road 12.4km further. The trail starts on the opposite side of the road, 40m ahead. The walk starts by passing through the farmland adjacent to Highland Lakes Road. From here Quamby Bluff towering at 1250m, is clearly visible above the treeline. 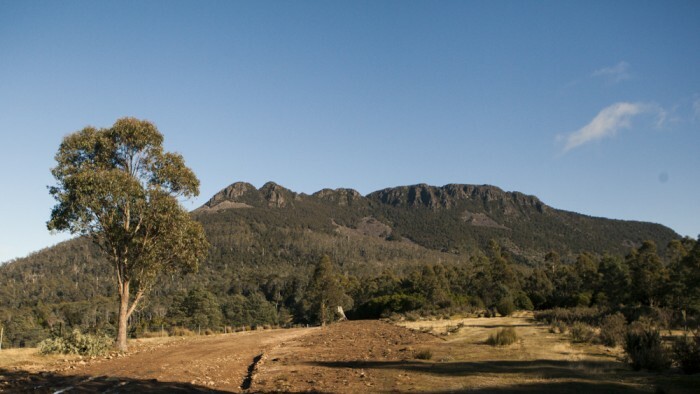 The trail shortly enters eucalypt forest and gently climbs via a well-marked track. For the next kilometre the trail gradually gets steeper, tunneling through sections of vibrant rainforest before exiting onto a large rock spree. Cairns lead the way up the 150m of steep rock steps and the trail re-enters the forest on the opposite side. 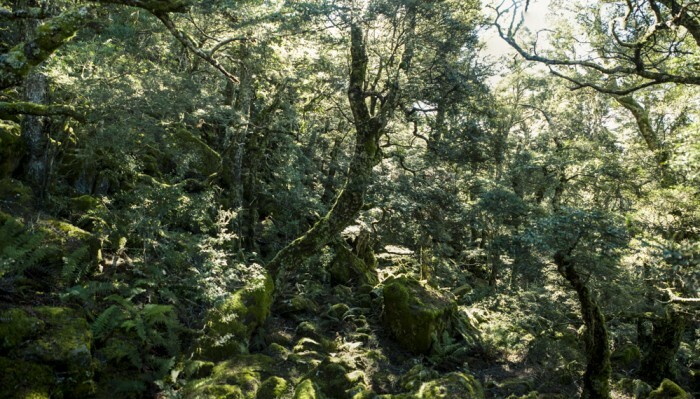 For the next 30 minutes the trial climbs through some of the most spectacular and dense Myrtle forests found in Tasmania before the trail levels out slightly. The break in climbing is short lived however, as the steepest section directly below the summit is climbed next. This section can be difficult under ice or during adverse weather conditions and care should be taken. Once above the forest canopy the trail continues up the western rock face towards the summit, passing the rugged alpine flora. As you climb, views of the outstanding Great Western Tiers begin to present themselves to your left. From the top the trail continues 500m further through beautiful alpine gardens to the north-eastern face of Quamby Bluff. From here 360 degree views are achieved including the impressive Deception Bluff to the east. On clear days Devonport and the Bass Straight can be spotted in the distance to the north. Return via the same route. Quamby Bluff is a challenging but extremely rewarding short walk involving a great deal of climbing. Because of this, it is recommend that the trail is only attempted on clear days as the alpine weather at the summit can easily turn bad on wetter days. 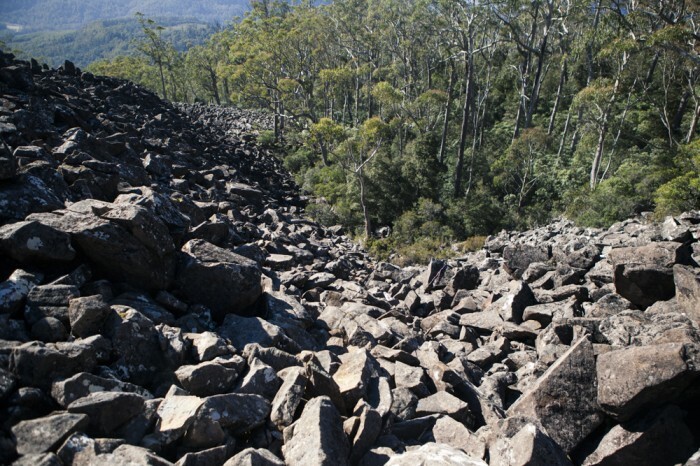 There are many steep rock sprees and cliff faces along the Quamby Bluff track, take care when nearing edges. High winds and cold weather can come in quickly on top, be sure to pack appropriate clothing for all conditions.